Add your NOVA ALLIANCE BANK Visa debit or credit card to Apple Pay, Google Pay or Samsung Pay and start paying using your smartphone or other device now. NOVA Alliance Bank Visa debit and credit cards can now be added to digital pay solutions Apple Pay, Google PayTM and Samsung Pay. Use the tabs below to find out how to add cards and transact depending on the device you’re using. You can make a payment within an App or participating website if you can see the Apple Pay icon during checkout. Enter your billing, shipping and contact information (you should only have to do this once as Apple Pay will store that information). If you want to pay with a different card, tap > next to your card. When you are ready, make the purchase by completing the device’s second-level security (Passcode etc.) and once the payment information sends successfully, you’ll see ‘Done’ and a checkmark on the screen. You can make a payment on a website using a Mac but the Mac needs to be signed into the same iCloud account as the iPhone and have Bluetooth enabled on your Mac. Follow the prompts. You can view the last 10 transactions made using Apple Pay on that device within the Wallet App. Your card details are not stored on the device or in the Cloud. Instead, when a card is added to Apple Pay, a Device Account Number replaces the need for the card number. This Device Account Number is used to make secure purchases in stores and within apps and websites. It will not work if it is compromised in any way and cannot be used outside of the device it is assigend to. The Device Account Number can be found by opening the Wallet App and tapping the (i) symbol on the bottom right corner and then scrolling down to find the Device Account Number. A single card can be added to Apple Pay on up to nine different devices but the card will need to be added to each device separately. Up to eight cards can be added to Apple Pay on a single device. The first card added to the device becomes the default card but you can change the default card. Find out what devices are compatible with Apple Pay. 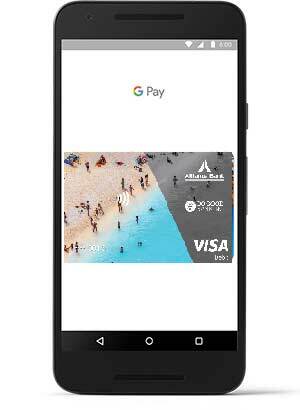 You can use Google Pay almost anywhere contactless payments are accepted – just look out for the payWave and Google Pay logos. You can also make in-app purchases when you see ‘buy with Google Pay’ and in participating mobile apps. The first card you upload to Google Pay will be your preferred card. You can swap your preferred card at any time within the Google Pay App. As long as you have an Android phone running Lollipop 5.0 or above that is NFC enabled you should be fine to use Google Pay. To check the operating system on your device, go to Settings – About – Device – Android version. Don’t get confused between Google Pay and Google Wallet – Google Wallet is a separate App that allows you to send and request money but Google Pay is the App you want to add NOVA Alliance Bank cards and to be able to transact on these cards digitally. You can pay on the web where Samsung Pay is available by selecting Samsung Pay as the payment method during checkout and then authenticate with your fignerprint, Passcode or iris scan. Near Field Communication (NFC) and Magnetic Secure Transaction (MST) support means that Samsung Pay is accepted virtually anywhere you can pay by tapping or swiping your card. 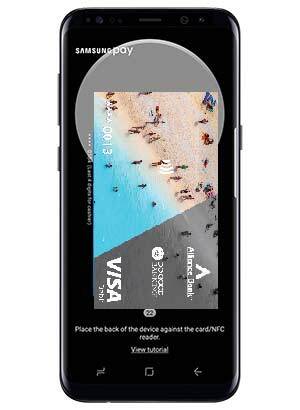 MST technology means Samsung Pay can be used almost everywhere around the globe. You can add up to 10 payment cards to Samsung Pay. Find out what devices are compatible with Samsung Pay. There is no default card in Samsung Pay. When you open the App or activate the Simple Pay feature by swiping up from the home key on supported screens, the first card displayed is either the last card you registered or the last card you viewed or used. Samsung Pay uses Tokenisation, a Secure Environment, and Samsung KNOX to secure your payment information. Additionally, you verify either using your fingerprint, iris scanner (Galaxy S8 and Galaxy S8+ devices (or later) only) or a 4-digit Passcode when making purchases. For out more about Samsung Pay security features. Digital pay transactions are protected by our 24/7 fraud monitoring service. Are you using the NPP to send and receive instant payments? What NOVA Alliance Bank cards can be used for digital payments? The Visa debit and Visa credit cards can be added to the digital wallet solutions. The rediCARD cannot be used as it does not have contactless functionality. The actual debit or credit card numbers are not stored on your phone or device, so your card details are safe. Additional information on security measures can be found in the specific ‘More about’ expand areas for each of the digital pay solutions. No. These are treated as contactless Visa transactions and go through the credit network – refer to the NOVA Alliance Bank Schedule of Fees and Charges for details. Keep in mind some retailers may apply a Visa credit surcharge to purchases and this applies to digital payments. 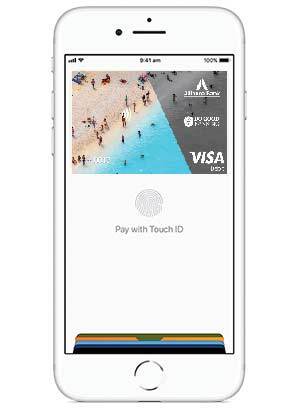 In addition, retailers now have the option to push contactless payments through as EFTPOS transactions (SAV) so this may impact fees you are charged. You require an active data plan or Wi-fi connection to add a card to a digital wallet and based upon your mobile plan and network, additional message and/or data charges may apply. Why are the mobile phone or email details used to verify a new card not the same as the details registered with NOVA ALLIANCE BANK? I'm trying to add a brand new card to a digital wallet but I only get one option to authenticate the card and that's to phone the card veritifcation line - why? The POS terminal in store is not accepting payment from my device - why? The POS terminal must be equipped to process contactless transactions. Some device cases can also interfere with the transmitting of the necessary information – try turning the phone over so the phone screen is closest to the POS terminal or you may need to remove the device from the case. In addition, once you authenticate to process a digital payment, some devices will give you a certain timeframe to complete the transaction – if this time passes the device will stop transmitting the necessary information. In this case, you should repeat the process. If you see a pending transaction for $0.00 with the description ‘Visa Provisioning Service (USD)’ on the account your NOVA Alliance Bank card is linked to (the same card that you’ve just added to a digital wallet), this is part of the authentication process and there is no need to be alarmed. It will disappear after a few days. Of course, if you have any concerns about any transactions on any of your accounts, phone us on (02) 4926 1428 immediately. If you feel you’ve misplaced a physical card but it’s in a secure environment and you are confident of finding it, you can use the NOVA Alliance Bank App to temporarily lock the card. This will also stop the card from working in a digital wallet. Once you’ve found the card, simply unlock and start using it again. If the card is permanently lost or stolen, you should immediately either use the NOVA Alliance Bank App to report the card lost or stolen or phone us on (02) 4926 1428. If your device is lost or stolen, if available you can use the Find My Mobile service to remotely lock or wipe your device (also locking or wiping the digital wallet and all the payment cards registered in it). You can also contact NOVA ALLIANCE BANK to cancel linked card(s) as this will also cancel them within the digital pay environment.